TiVald Sim Interface v1.0 KIT - you can clone or back up to 8 cards into 1 Silver card (in complete set) using our device. Also phone book reading, SMS editing, PIN management and etc! Let's result some variants of use where it is actual. It is necessary to have in view of, that there is a simple opportunity to create in one smart - card from 1 up to 8 copies of SIM-cards of various cellular operators and to use these operators in the most convenient combinations. If you use several mobile phones for example in the automobile to rearrange a card(map) in the automobile terminal it is not required, simply switch off personal phone and include automobile. Agree, it is convenient! on mobile communication as copying of cards of various operators allows to bring all of them (up to 10!) in one SIM-card and to be switched between them through the menu of phone very quickly. If at you is familiar or relatives abroad and when they will be going to go to you, you can get a package of the prepaid services, and the data from a card to send them. When they will drive in your country, they should not be used roamings fabulous tariffs. As and on the contrary when you decide to go to them. In a word, variants of use of this technology much enough, directions of movement are here again specified only. And the main thing consists that you can save essentially money and time, and thus you constantly remain on communication ! First You need to programm the Sim Card with special software by using our TiVald Sim Interface. When you insert a SIM-card into your mobile phone, in the menu there is a new option. From it(her) you can create up to 10 various phone numbers in this SIM-card and choose what you want to use at present. Initially in a SIM-card any telephone numbers are not programmed. You can enter telephone numbers from your existing SIM-cards. 10in1 the SIM-card provides the same functions as my SIM-card ? Yes. You will have various PIN-numbers, PUK-numbers and telephone numbers of center SMS for each number, written down in 10in1 to a SIM-card. On a SIM-card can be kept: a telephone directory up to 250 numbers and up to 40 SMS. All telephone numbers will simultaneously work? No, you can use only one telephone number lumpsum. If you want to change active number, it is necessary for you to choose it through the menu or to choose Reset and to enter PIN for necessary number that it was possible to make it, you should appoint the PIN for each number in a SIM-card. Whether the SIM-card has advantages 10in1? If you on a regular basis use more than one SIM-card, it - the best decision. There is no more need to carry some mobile phones with itself or opening each time phone when you want to change a SIM-card. With GSM 10in1 a SIM-card you will have all your numbers in an ode to a SIM-card and will have an opportunity to choose, what you want to use that. It will work with my operator GSM and with my mobile phone? 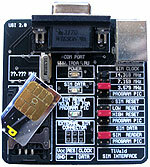 GSM 10in1 the SIM-card works with any operator who uses COMP128 v1 algorithm in his SIM-cards. It has been checked up successfully with the majority of European operators GSM, and should not have any problems in work with anyone others. It also has been checked successfully up with mobile phones of popular brands, such as SonyEricsson, Nokia, Ericsson, Siemens, Sony, Alcatel, Motorola, Samsung, etc. For preservation of the data of the SIM-card, on a case of loss. The legislation of some countries forbids creation and-or use of clones GSM Sim-cards and-or Sat-TV cards (read laws !). All backUp function support A3A8 COMP128V1 SIM Cards only. This TiVald Sim Interface v1.0 doesn't support newest SIM Cards that uses COMP128V2 algorythm to code KI key.